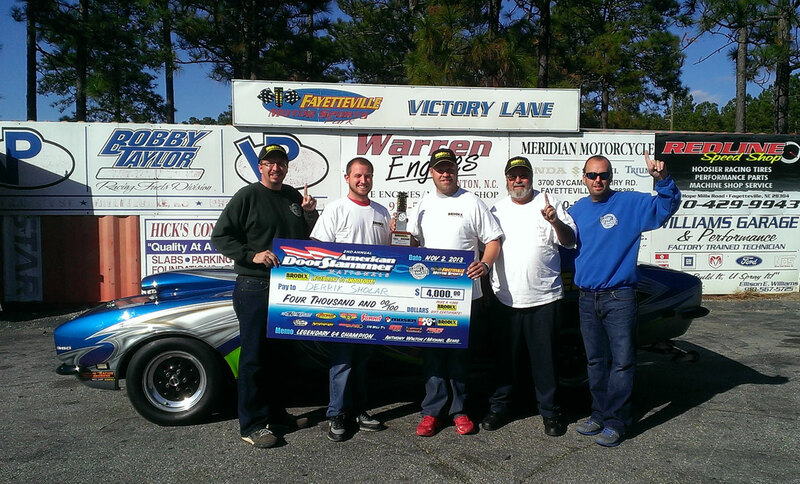 The Loose Rocker Promotions team of Anthony Walton and Michael Beard returned to Fayetteville Motorsports Park in Fayetteville, N.C. for the 2nd Annual American Doorslammer Nationals on November 2-4, 2013. 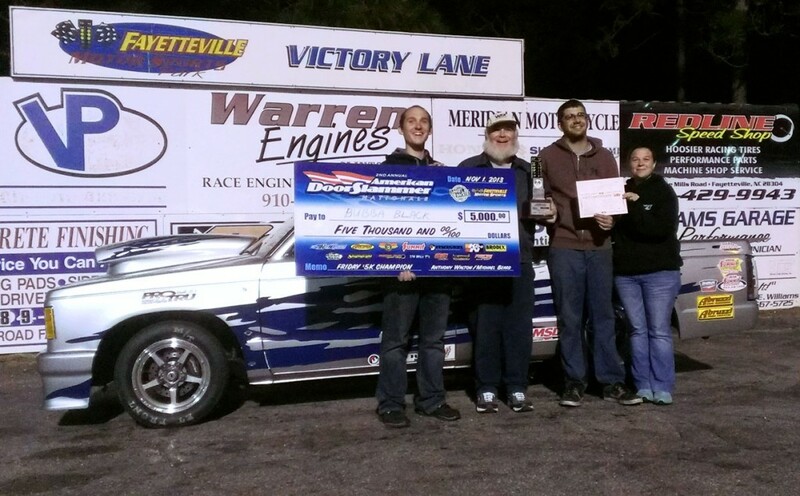 The event featured big money bracket racing dedicated to solely to delay box door cars, with two $5,000-to-win events, a special $4,000-to-win 64-car BRODIX Legendary 64 Shootout, and a $20,000-to-win main event, along with $8,000 in prizes awarded throughout the weekend. Ray Holmes, from Richmond, Va., scored the biggest payday of his young career behind the wheel of his family’s super clean ’63 Corvette. 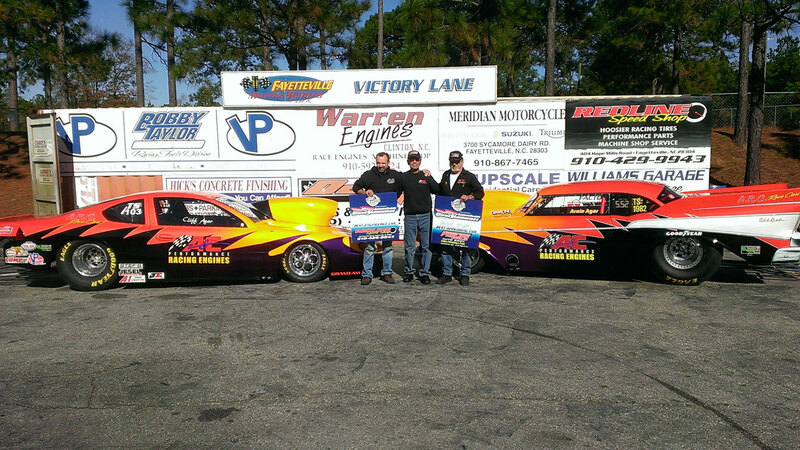 Holmes’ father races, and his brother won the IHRA Div. 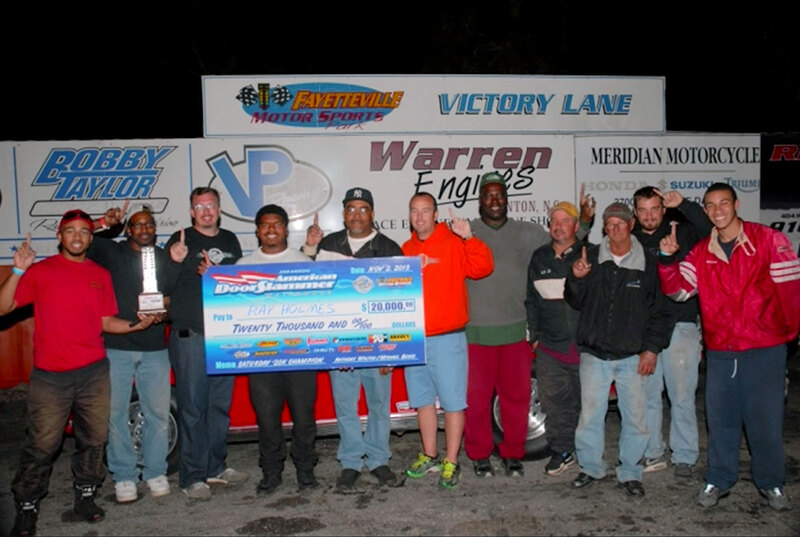 9 Team Finals Junior Dragster title in 2011. Dipping into the 6.20’s, that’s one good working split-window! “I ran the doorslammer race at Piedmont two years ago, and I just made it a yearly event. I had a good time, and it was run really well. It keeps you focused when things are run in an orderly fashion,” said Holmes. As even the Pros will tell you, the winner of any major race typically has one lucky round. 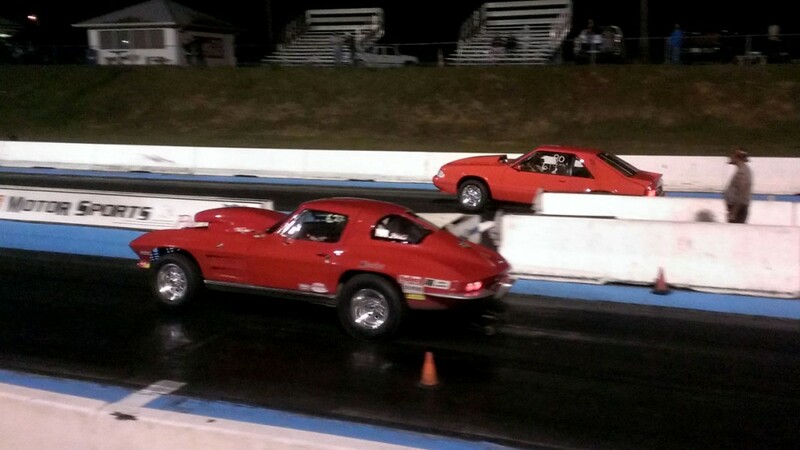 Holmes tallied his in the semifinals when former IHRA Bracket Finals Champ Randy Sessoms blinked the red-eye with a -.006 foul, giving up a 6.271 (6.28 dial-in) effort. Holmes left with a conservative .044 reaction time, but posted an uncontested 6.283 (6.29) to advance to the finals. 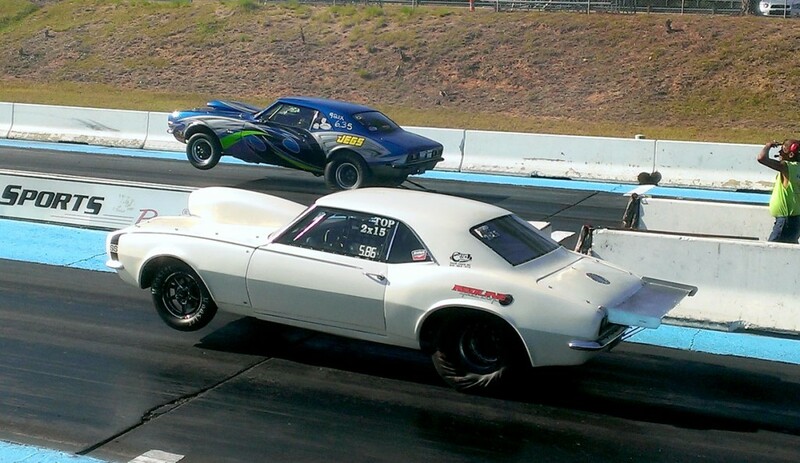 In a battle of the Fox-bodied Mustangs, William Brewer used a stout .012-backed dead-on 6.189 to oust former $20K champ William Roberts, who was left nowhere to go .027 initiated 5.886 (5.89). The situation was reversed in the finals, where Holmes packaged up Brewer with a solid .015 light coupled with a 6.283 (6.27). Brewer broke out behind him with an .047 light and a 6.185 (6.19). Holmes enjoyed the winner’s circle with a huge $20,000 Big Check and an Iron Tree trophy. On the surface, it looked like an unlikely scenario all the way around: You have a young skinny guy nicknamed Bubba who is normally a bottom-bulb racer, competing at a delay box doorslammer race. Anyone that really knows Fenelton, Pa.’s Chris Black, however, wouldn’t discount him for a second. At the end of a late night of running two races in one day, the name on the $5K Warmup Big Check said Bubba Black. Black branched out into IHRA Hot Rod this year, learning his way around delay boxes and throttle stops well enough to earn a runner-up at Grand Bend. 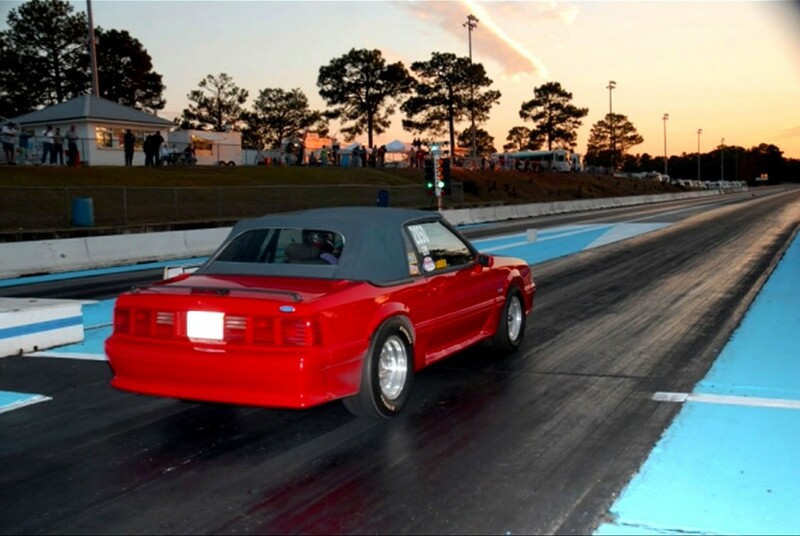 While Black is primarily a No-Box guy, he’s top-bulbed with the delay box a handful of times each year, and he’s also gone to the opposite extreme, footbraking his S-10 at Loose Rocker’s Fall Footbrake Frenzy last year. Black and “Obe” did just that, coming right back to the lanes for a splash n’ go and a Chinese fire drill. They were still doubled at 12 cars. In the semifinals, Howard Brewer rocked out of the beams to trip the red light and send William Brewer to his second final round of the night with an .030 light and a 6.115. Black was able to take a stab at the tree on his earned bye run with a -.003 start to set up for the finals. Drama ensued when Brewer was unable to get his Mustang started. Black displayed great sportsmanship and calmly waited for his opponent, whose starter and flywheel continued to chatter. A starter bolt had stripped out, and some brave soul reached under the car to hold the starter in place long enough for the starter to engage. The race was won on the race track as it should be, but Brewer had to settle for his second runner-up of the night with an .034-initiated breakout 6.105 (6.11). 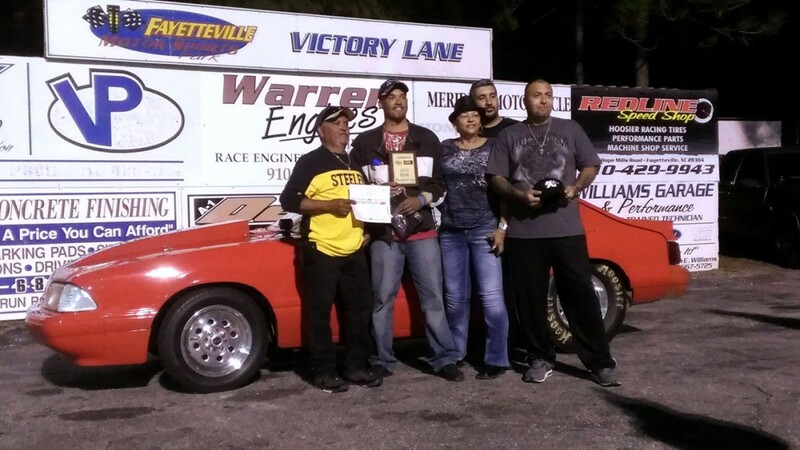 Black’s .015-backed dead-on 6.282 sealed the deal for the big win. Sholar proved that point by running dead-on four times in the six round BRODIX Legendary 64 Shootout, which featured elite competition among 64 drivers with no buybacks and no double entries. “I actually like that. That’s why I run the IHRA Pro-Am races. When you lose, you’re done,” he said. In the semifinals, Sholar’s .010 light and dead-on 6.353 packaged up David Clark’s late and under .044, 5.785 (5.80). Jarrett Creech survived a double redlight situation with his Redline Speed Shop Camaro against Lyn Baldwin, who left first with a -.004 red, giving Creech free reign to move to the finals with an -.015 early leave, coupled with a 5.872 (5.86). 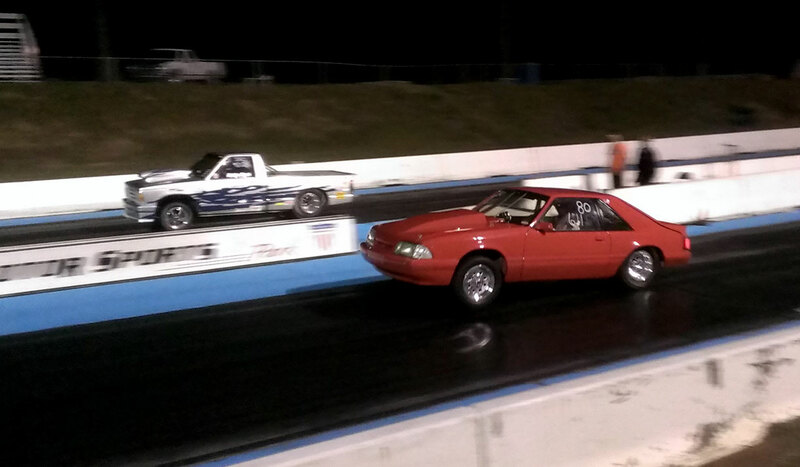 Creech bounced back from his nearly costly mistake, nailing an .013 light in the finals, and running a dead-on 5.866. 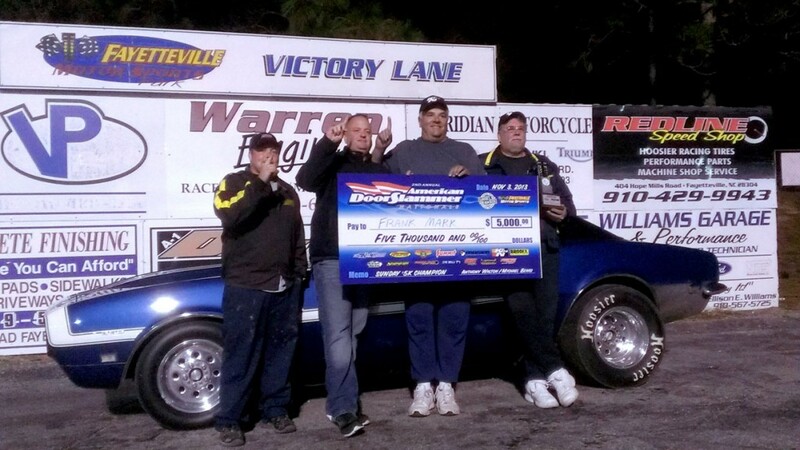 Sholar would not be stopped, however, as he duplicated his semifinal performance with another .010 bulb and dead-on 6.351 to capture the $4,000 Big Check plus the $1,000 BRODIX Gift Certificate. Don’t let Frank Mark’s easy smile and carefree attitude make you ease up on the race track. While the Tomkin’s Cove, N.Y. driver let go of any pressure worries many years ago, it’s made him more competitive, not less. “Every round is a clean slate. It doesn’t matter if it’s a final, the semis, the quarters, or first round. You can’t get all wrapped around the axle. Just race,” he advised. Mark is more widely known for his accomplishments on the big money bracket racing scene in his dragster, at the end of last year he hooked up with long-time friend John Davis to campaign his 350-powered ’68 Camaro at select events. With Chad Duke still doubled at six cars, Mark knocked out one of his entries and his .009 light earned him an important bye run into the finals. 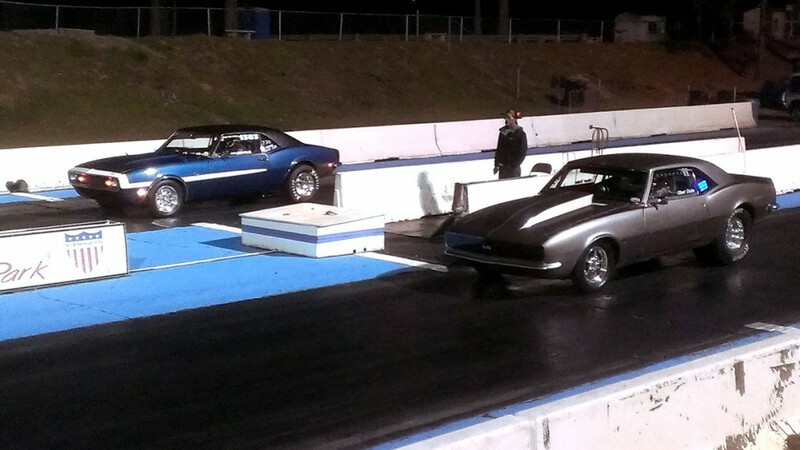 Duke kept his ’68 Camaro alive on one entry, and advanced to the finals with a .004-backed 5.930 (5.92) when Tom Coonly fouled away a 6.128 (6.11) effort with an -.016 red light. Mark tested his theory about the lanes with his semifinal bye run, turning it -.003 red before clicking it off at half track. Duke turned it -.011 red to put an early end to the drama. With the win light already in hand, Mark dropped at half track, came to a stop just past the finish, pulled on the Camaro’s hazard lights, and backed up the track all the way to the winner’s circle. Mark thanked John Davis, along with George Rupert for the deadly 390 cfm alky carburetor. 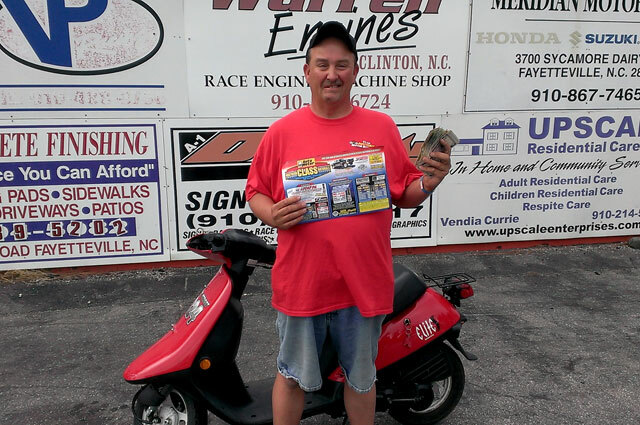 “The payouts were great, and we had a fun weekend. We’ll definitely be back!” he concluded. $300 + $200 Summit Gift Card! $200 + $200 Summit Gift Card!